“Us and them” Pink Floyd sang on the eponymous song years ago, “me and you.” It’s the quintessential framing of all of our conflicts – the only one we ever know is ourselves and everyone else is an other, a ‘them’ to be (potentially) feared. But at least we can know ourselves. Undermining that bedrock assumption is truly terrifying, and thus makes for a truly unsettling premise in writer-director Jordan Peele’s sophomore effort Us, potentially speeding past thrills and embracing Lynchian levels of existential dread. 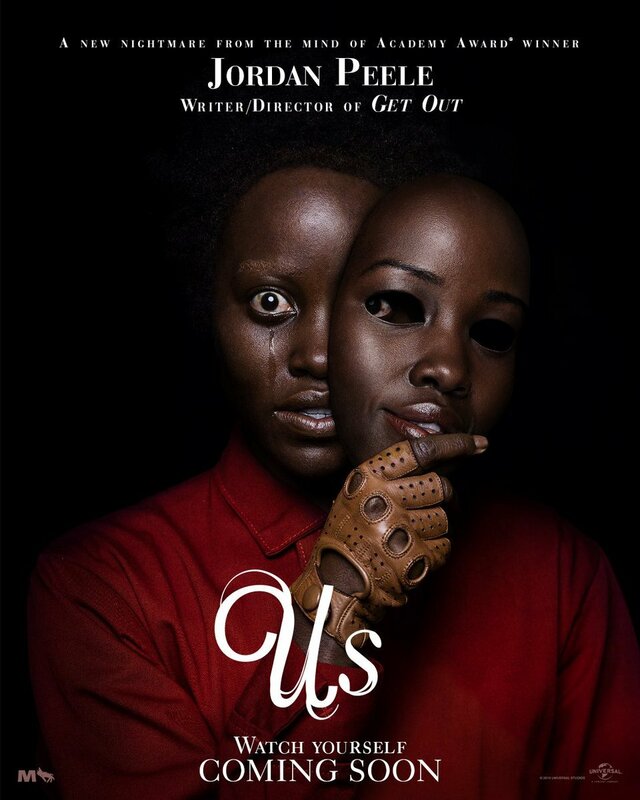 Like a bullet unfired much of that potential energy remains unreleased — Peele the director teases pulling the trigger often and as often backs off — but the object itself is still plenty scary when aimed at you. It’s the kind of situation which would make a person feel permanently unsettled, a frame of mind Adelaide Wilson (Nyong’o) can relate to. Her attempts to relax during a family vacation are consistently undermined by strange coincidences and a general sense of dread which seems to follow her no matter what she does. Coincidences turn out to be the least of her problems, however, when she and her family are attacked by a group of identical duplicates intent on killing them and taking over their lives. Desperately searching for help she discovers a world overrun with duplicates and no way to truly tell who is ‘me’ and who is ‘you’ anymore. If Get Out was informed by a very specific type of life experience, Us digs into general existentialism in a big way, diving into some of the same waters Dostoevsky and Stanislaw Lem once churned albeit with hefty doses of violence and humor and far less philosophizing. It’s the kind of heady, high-concept horror we don’t get much of outside of far out works like Upstream Color or On Body and Soul. Peele refuses to disappear into his concept – as easy as that could be – focusing on building his characters more than his theme (for better or worse). Each member of the Wilson family is well defined, refusing to be reduced to just their primary traits — Zora (Wright) is a runner, Jason (Alex) likes fire, Gabe (Duke) is a goofball — nor become other than they are even when faced with the horrific. It helps greatly that Peele’s dialogue, if not artful, is full of humor and refuses to settle for the sort of banal attempts at hipness which much of the genre seems happy with. It gives the actors a lot of meat to chew on, particularly Moss (who is hilariously middle-class vile) and Duke (who seems to be doing an impression of Peele himself, like the lead actor of any given Woody Allen film). Peele’s also upped his game visually, giving Us a lush look and taking more chances with his camera and character movement, both playing with and going against the horror grain. Not every experiment is successful – a tendency to move to extreme wide shots during moments of violence adds clarity but disengages emotion. That’s not a one-off issue either, as Us so frequently comes close to the water’s edge only to back off at the last moment. Peele shamelessly engages in bait and switch, continually introducing new throwaway characters to have violence enacted upon in order to protect his main characters. It leads to a lot of time being spent running in circles without a lot of development, making the last hour feel increasingly padded [A feeling which is exacerbated during an extended monologue explaining all of the backstory which Us would be much better without]. This could be fine if he was saving that space in order to develop his theme, but Peele isn’t interested in that. It’s more about mood than theme, largely in order to protect a twist which observant viewers should intuit by the halfway mark. The cost/benefit of that choice isn’t high and Us never quite recovers from it, with more focus on protecting rather than endangering it’s most important elements, sacrificing vitality as a result. 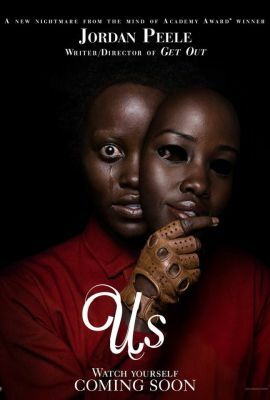 None of that should take away from the strength of what Peele has produced; if nothing else the craftsmanship and understanding of what the genre needs on view is reason enough for the film to exist. But it’s also a checklist of what would be better off avoided in the future in order to unleash the masterpieces it seems like Peele has lying within him. The bullet loaded and primed correctly is necessary, but it needs to be fired or the target will never be reached.